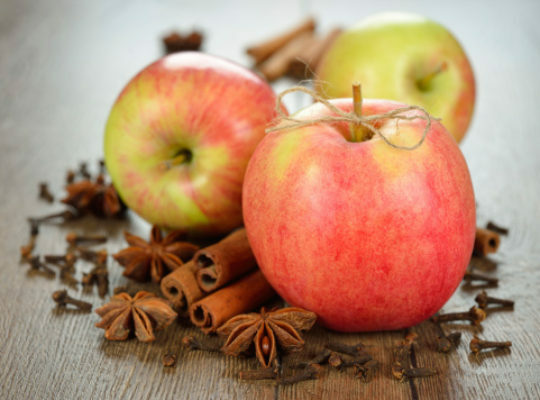 This recipe is perfect for fall when there are so many different types of apples to choose from. Sautéed in apple butter and mixed with cinnamon—what's not to like about this dessert? Cut apples into quarters, discarding stems, cores and seeds. Then cut quarters into slices. Heat a large, nonstick skillet over medium-high heat until hot. Add apples and cook until they begin to brown, about 4 minutes, tossing occasionally. Stir in apple butter, apple juice and cinnamon, and continue to cook 5 to 8 minutes, or until apples are tender and sauce thickens, tossing frequently. Transfer to dessert plates, top with nuts and serve with frozen yogurt. Recipe provided by the Cleveland Clinic Wellness Institute dietitians.